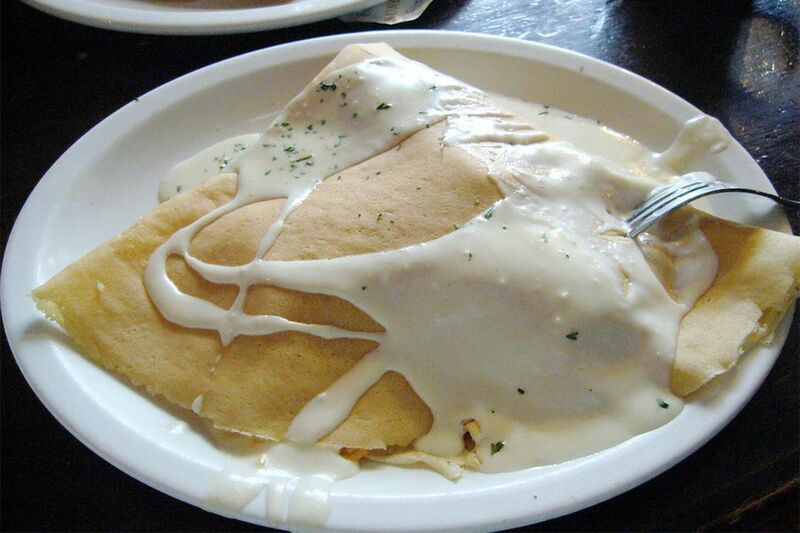 Béchamel is a basic cream sauce that is a staple white sauce used in French cuisine. Because it is typically made with dairy products, you need a modified recipe to make it dairy-free or vegan. You will replace the dairy products with plant-based milk and oil. The sauce is typically prepared by making a roux by whisking butter and flour together over low heat and then adding milk or heavy cream, salt, and pepper. Some traditional recipes will also sauté a combination of onions, carrots, and celery before adding it to the other ingredients. This simple savory cream sauce is delicious served with vegetables, fish, meat, and grain dishes. But it is also a blank canvas that can be dressed up with spices, herbs, or vegetables. This dairy-free version is a go-to sauce to make whenever you need it. Add the flour, stirring constantly with a wire whisk for 1 to 2 minutes, or until the flour smells slightly toasted but is not burning. Whisking constantly, add the soymilk, carefully pouring it down the side of the saucepan. The sauce will sizzle and bubble slightly, and it is important to continue to vigorously stir at this point to prevent your sauce from forming clumps of flour or burning. If this should happen, simply pour your sauce through a fine sieve or strainer before serving. Cook the sauce until desired thickness is reached. Serve hot. This sauce is best served right after it is made. This dairy-free version of béchamel sauce can be used to thicken foods such as soups or stews without cream or milk. This sauce is also used over bread and with savory items such as meaty dishes. Other dishes that use béchamel sauce include lasagna, soufflé, macaroni and cheese, casseroles, and gratins. You can also use it to make the best tuna noodle casserole or vegetable pot pie. This sauce is sensitive to heat and air. Cool the sauce soon after cooking and store it immediately. Before storing the sauce in the refrigerator, be sure to cover the sauce with cling film actually touching the sauce. This will prevent the sauce from forming a skin or hardening. Then cover the sauce with a lid in an air-tight container. The sauce can be kept safely for four to five days in the refrigerator. The sauce can be frozen as well. To use the sauce, reheat it to 165 F in a saucepan before serving.